Mike ‘ExcelisFun’ Girivn checks in for day 3 of VLOOKUP WEEK 2012 with “INDEX and MATCH How To”. There are approximately 30 examples in this 1 hour ‘+’ video! 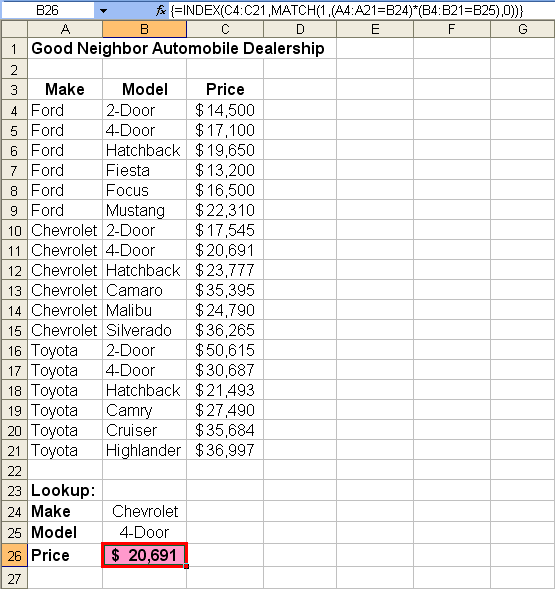 Today’s post from Tom Urtis involves finding the record that matches two criteria, such as Chevrolet in column A and 4-Door in column B. The solution involves INDEX, MATCH entered as an array formula, so this is ranked pretty high on the Excel spicy scale. Read the complete article here. When I announced VLOOKUP Week, Charley Kyd was one of the first to respond with something along the lines of “I never use VLOOKUP and I will be happy to tell you why!” Although Charley was one of the first to respond, I figured I should hold this post for a few days so I did not burst the bubble of anyone new to VLOOKUP. To read why Charley likes INDEX/MATCH better than VLOOKUP, check out his complete post.